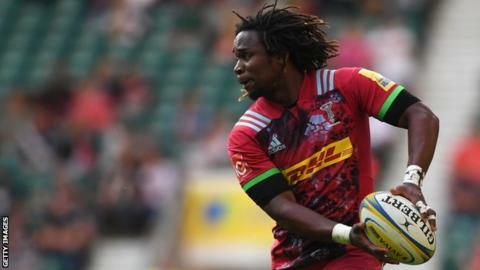 Sale Sharks have signed England wing Marland Yarde from fellow Premiership side Harlequins on a three-year deal. The 25-year-old, who won his 13th England cap on the summer tour of Argentina, was left out of Eddie Jones' squad for the autumn internationals. Yarde is thought to have been unsettled and was dropped from Quins' Champions Cup game at Wasps for missing training. Allowing him to leave was "in the best interest" of Harlequins, said director of rugby John Kingston. He added: "Every decision I make is with the intention of doing the right thing for Harlequins, and that's the way it will always be. "I'm building a positive environment and culture at Harlequins, on and off the field, which I believe will ultimately allow us to challenge for honours." Yarde started his professional career with London Irish in 2010 and spent four years with the Exiles, making 47 appearances and scoring 13 tries. He moved to Harlequins in 2014, scoring 18 tries in 62 appearances for the west London side. Sale boss Steve Diamond said: "He is a very exciting player and he will very much suit our attacking style of play. Over the past few years, Marland's off-field behaviour has not been in line with the core values, culture and beliefs of Harlequins, and that is what has led to this decision being made. Any player can make a mistake - but I think we are talking about a player who is a repeat offender. Missing training was the straw that broke the camel's back. There is only so much a coach can do. It is a series of events that has led to John Kingston putting his foot down. We are not talking about drink-driving and drugs and all that kind of stuff, but behaviour that has an adverse effect on the rest of the team. I think there have been players who have felt Marland got away with things other players would not have done. I have got to defend John Kingston. He has probably put more time, effort and emotional energy into Marland than he has any other player in his 18 months in charge. He has been desperate for Marland to fulfil his potential and be the player we all see him to be. He has played well for Harlequins - but it has always been his off-field manner than has held him back. His biggest obstacle is going to be himself. Marland would have liked to have stayed at the club, but equally he sees this as a massive opportunity to get a fresh start.